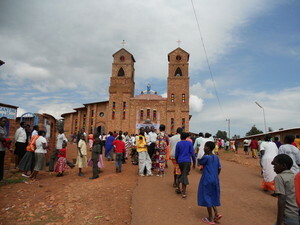 The Saint Patron of the Parish of Nyagatare is "Therese de l'Enfant Jesus". It was founded in the year 1996 and is located in the Deanery of Nyagatare. The Parish of Nyagatare has 11 stations and 13 branches, it consists of 97 basic ecclesial communities. Statistics from the year 2014 indicate that the Parish of Nyagatare has a total population of 74237 inhabitants, among them 18802 Catholic Christians, or 25.33% of the population. Among Catholic Christians there are 17296 baptized and 1506 catechumens.